In his final post about the UK’s renegotiation strategies, Frank Vibert argues that the climate of populist scepticism about the EU has raised the temperature generated by UK demands for extra ‘sovereignty’. UK demands may induce member states and Brussels institutions to alter course – or alternatively to hold fast to current strategies of stressing EU citizens’ rights, but not their consent. In recent years there has been an upsurge across Europe of what is usually referred to as ‘populism’, by which is meant the rise of ‘extreme’ parties – sitting further right or further left than the mainstream centre-left/centre-right groupings that have largely dominated European politics in the post-war era, and especially since the fall of communism. In the UK, UKIP is often seen as a rightwing example of this phenomenon. France has the Front National, and Hungary Jobbik. In Spain, Podemos is often cited as a leftwing example, Greece has Syriza, while Jeremy Corbyn’s unexpected rise to lead the Labour party might have a similar explanation. In seeking to explain this phenomenon, political scientists often offer an economic rationale. This interprets populism as primarily a ‘backlash’ response to the 2008 economic crisis and austerity, lower growth expectations for the future and the difficulties faced by ‘blue collar’ workers in today’s ‘knowledge’ economy. If the economic ‘explanation’ of populism is correct, then European leaders can hope that that these movements and parties will fade as economic prospects improve. An alternative explanation is more politico-cultural. It holds that the European Union has failed to find a political structure that responds to what significant numbers of people want. Partly this is a problem of distance – the gulf between the Brussels ‘bubble’ and the everyday concerns of ordinary voters. Partly it is a problem of ‘insiders’ versus ‘outsiders’ – the gap between the elites who know how to influence the Brussels game and those who feel excluded and out of the loop. A key flashpoint for rightwing parties has been concerns over immigration levels and ‘anti-foreigner’ reactions, discussed in my earlier post. For left populists, it is the EU’s involvement in the imposition of harsh austerity conditions on their countries that is key. If the political ‘explanation’ is correct then populism is probably here to stay – unless the EU reforms its political structures in fairly radical ways. Populism, together with the spreading sense that it may represent more than a passing mood, is a cause of great unease across the established mainstream parties in Europe. It is not just the British Conservative party’s concern about UKIP. It is this more general sense of unease about the structure of politics that provides the backdrop to Cameron’s demands on ‘sovereignty’. 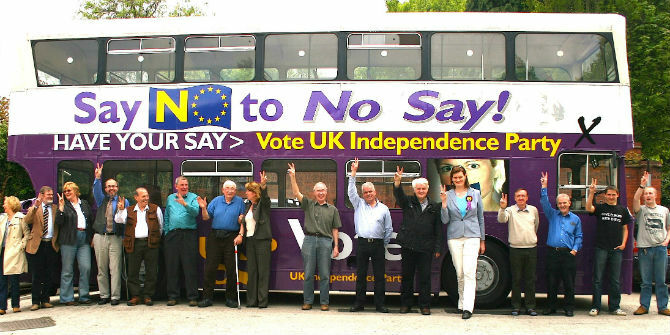 West Midlands Ukip campaigners and their battlebus in 2009. Photo: EuroRealist Newsletter via a Flickr Creative Commons licence. It seems unfortunate that David Cameron has sought to voice British concerns about the political structure of the EU using the peculiarly British terms of ‘sovereignty’. Of course this choice of language reflects the British convention that long-standing (but perhaps not now so applicable) UK view that the Westminster parliament is sovereign in the broad sense of having the final say on all matters of British legislation – including (still) arrangements for regionally devolved and local powers in the UK. According to this account, Parliament is the unique source of the powers of institutions that have public authority in the UK and of the rights of citizens. This is not the view of how power is exercised in the rest of the EU member states. Here, instead, written constitutions set out institutional roles and powers, and legislative procedures and rights. Often a separate constitutional court rules on matters in dispute between different institutions or parties. In the EU itself the treaties between member states act as a form of constitution and the Court is responsible for their interpretation (see the Treaty of the EU (TEU) Article 19, paragraph 1). The member states thus sit down to consider British demands about sovereignty without a shared understanding about what sovereignty itself means. This lack of a common understanding may not stand in the way of agreements on the specific items that David Cameron has identified in his letter to Donald Tusk. Under the current ‘yellow card’ system national parliaments are simply able to object to proposals from the Commission that they dislike (TEU Article 12 and Protocol). The UK now wants national parliaments to be able to actually block proposals from the Commission, and this idea may meet with some sympathy. Unfortunately for Cameron, however, the instances where British exceptionalism and the interests of other member states coincide may be few and far between. One thing that the Prime Minister’s letter does not explicitly refer to is consent. Yet the concept lies behind the whole British negotiation approach. The PM has been forced into the negotiation because a significant part of the British electorate no longer consents to the terms of British membership. He wishes to show that he can regain that consent with adjusted terms. One of the features of modern constitutionalism, including in the EU itself, is that the idea of the consent of the people to the constitutional framework and its provisions has been eroded. It has been replaced by the inclusion of declarations of rights within a constitution. Rights offer legal content and protections with which people can identify. So identification has replaced consent, which (in the word of one legal scholar) has now become ‘secondary’. The EU reflects this trend to emphasise identification through rights. The issue of consent extends beyond one country, in this case the UK, and beyond one occasion. Many member states fear that allowing for more expressions of consent by citizens will only lead to them rejecting more provisions and policies. So the question is whether the EU Treaty base should strengthen the provisions for the exercise of consent by citizens within member states. This would involve a much more extensive capacity for people to demand referendums, to block the transfer of powers to the EU, and to block the exercise of these powers at later implementation stages. In his letter David Cameron says that the UK is looking to achieve its negotiating objectives in forms that are legally binding. The problem for the British government is that it is completely unrealistic to expect that all the fundamental questions about the EU’s institutional and judicial structure (covered here and in my earlier posts) can be addressed within the necessarily short timeframe of the negotiations. At the most, it might be possible for the European Council to agree to set up an expert group to examine the underlying constitutional issues and to prepare alternative ways to approach them. Over the years, the EU has extended the reach of its policies and institutions through an adroit balance between what is visible in the Treaties and what is largely invisible to member states’ electorates. For instance, the principle of subsidiarity has been highly visible while the judicial doctrine of the supremacy of EU law over national constitutions (unstated in the Treaties) has not. The aim of ever closer union has been visible, but not the less visible procedures for trying to reach consensus solutions. European citizens’ rights have been visible, but their consent has been less visible (except for sporadic and exceptional national referenda on Treaty changes). British demands can be interpreted by other member states as a warning about the limits of a union conducted on the basis of the invisible – a warning that they should try to respond to if they wish to combat populism in their own countries. Alternatively, British demands can be seen as an unwelcome intrusion into a proven recipe for the attainment of increasing levels of mutual cooperation, whose spreading benefits will (eventually) lead to populism fading back to manageable levels. 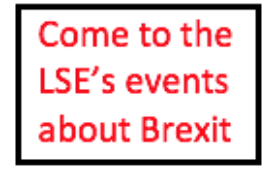 This article represents the views of the author and not those of the BrexitVote blog, nor the LSE. 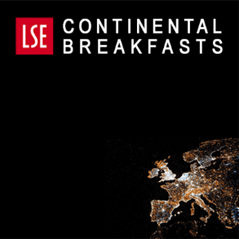 Frank Vibert is Senior Visiting Fellow in the LSE’s Government Department. He is the founder director of the European Policy Forum, and was senior advisor at the World Bank and senior fellow at the United Nations University WIDER Institute, Helsinki. His latest books are The New Regulatory Space: Reframing Democratic Governance (Elgar 2014), and Democracy and Dissent; The Challenge of International Rule Making (Edward Elgar, 2011). Going Dutch: can Cameron secure subsidiarity reforms without treaty change?